Arrival in Istanbul. Guided tour of the historical part of Istanbul - Blue Mosque, St. Sophia Museum which was Episcopal Church of the Byzantine capital, Hippodrome, old Sultan Top Kapi Palace, Galata bridge, The Sultan Palace Dolmabahche. Stop in the Asian part of Istanbul for a panoramic view and tea/coffee. Visit of Saphire skyscraper with panoramic view of the city. The tour continues golden horn bay and the Bulgarian Iron Church. Lunch. Accommodation. Free time or optional Boat cruise of the Bosphorus. Dinner. Overnight in Istanbul. Breakfast. Departure for Bulgaria. Arrival in Plovdiv in the afternoon. 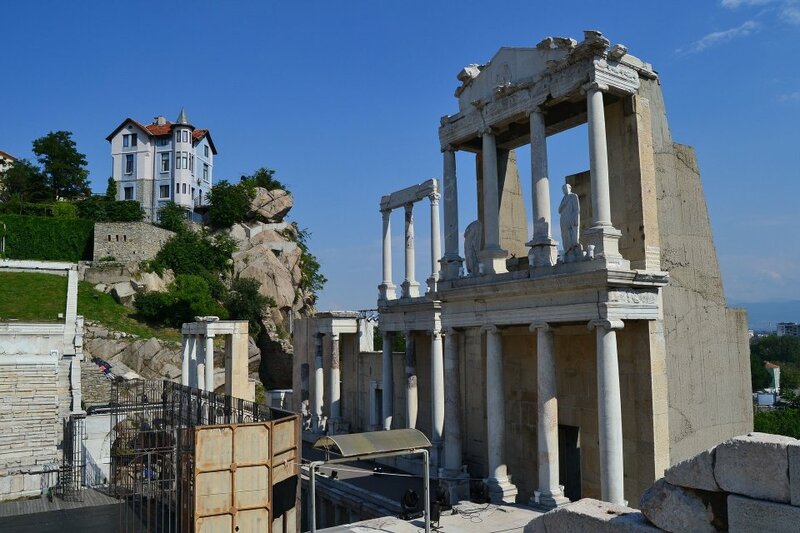 Sightseeing tour in the Old Town, including a visit to the Roman Ancient Theatre, the Ethnographic Museum, Roman Stadium, St. Constantine and Helena Church, etc. Dinner. Overnight in Plovdiv. Breakfast. Departure for Sofia. Guided sightseeing tour of the city centre, including visit to Alexander Nevski Cathedral - one of the largest Eastern Orthodox cathedrals in Europe, as well as one of Sofia’s symbols and a primary tourist attraction; St. George Rotunda, St. Sophia Church, National Theatre, Presidency, etc. Lunch. Free time. Dinner. Overnight in Sofia. Breakfast. Departure for Rila Monastery - the most exquisite example of the monastery art and architecture in Bulgaria. Visit of Nativity of the Virgin Church with its miracle icon of the Virgin and splendid gilded iconostasis, the old kitchen, the museum, keeping the long and heroic history of the monastery, Hrelyo’s Tower and many spectacular views of the mountain and the surrounding nature. Lunch near Rila Monastery. Drive to Melnik - the smallest town in Bulgaria. The town is famous for its wine cellars producing the best red wine in the country. Dinner. Overnight in Melnik area. Breakfast. Visit Rupite, best known as the place where the Bulgarian medium Baba Vanga lived and was buried. Departure for Macedonia. Lunch in Stobi Winery. Arrival in Skopje. Sightseeing tour in Skopje - Macedonia Square, the statue of Mother Teresa; the Memorial museum house of Mother Teresa, the Stone Bridge - symbol of Skopje; the church of St. Spas (Holy Salvation); Skopje Fortress, Old Varosha quarter, etc. Dinner. Overnight in Skopje. Breakfast. Departure for Nish. Sightseeing of the town: Nish Fortress built by the Turks in the 18th century, the Tower of Skulls (Chele Kula), Villa Mediana – archaeological reserve, Roman villa-rustica from the 3rd century, probable birthplace of the Roman emperor – Constantine the Great. Lunch in Nis. Arrival in Belgrade. Free time. Dinner. Overnight in Belgrade. Breakfast. Walking tour in Belgrade from the Republic Square along the main pedestrian street to Kalemegdan Park and the Belgrade Fortress with its picturesque panorama to the confluence of Sava and Danube rivers. Lunch. In the afternoon optional tour to Sremski Karlovci and Novi Sad. Dinner at hotel. Overnight in Belgrade. Breakfast. Transfer to the airport and departure from Belgrade. Travel insurance; Personal expenses, drinks, entrances for the individually visited places of interest, luggage portage, tips. This tour operates for minimum 20 tourists. България, Македония, Сърбия, Турция: Няма медицински и здравни изисквания, свързани с пътуването. България: Българските граждани, пътуващи в България, е необходимо да притежават валидна лична карта. Македония, Сърбия: Българските граждани, пътуващи за страната, е необходимо да притежават валиден паспорт или лична карта минимум 6 месеца след датата на влизане в страната. Турция: Българските граждани, пътуващи за страната, е необходимо да притежават валиден паспорт със срок на валидност минимум 6 месеца след датата на влизане в страната.